Looked at a certain way, the entire story of "Shane" is simply a backdrop against which the hero can play out his own personal repression and remorse. The movie is conventionally seen as the story of farmers standing up to the brutal law of the gun in the Old West, with a lone rider helping a settler hold onto his land in the face of hired thugs. Look a little more carefully and you find that the rider and the farmer's wife feel an attraction for one another. And that Shane is touched by the admiration of young Joey, the son of the farm couple. Bring Freud into the picture and you uncover all sorts of possibilities, as the newcomer dresses in sissy clothes and absorbs insults and punishment from the goons at the saloon, before strapping on his six-gun and proving himself the better man. It's not that a greater truth lurks in the depths of George Stevens' "Shane" (1953). It's that all of these levels coexist, making the movie more complex than a simple morality play. Yes, on the surface, Shane is the gunfighter who wants to leave his past behind him, who yearns for the sort of domesticity he finds on Joe Starrett's place in the Grand Tetons. Yes, someone has to stand up to the brutal Rufus Ryker (Emile Meyer), who wants to tear down the fences and allow his cattle to roam free. Yes, Shane is the man--even though he knows that if he succeeds he'll have to leave the valley. "There's no living with a killing," Shane tells Joey, after shooting three men dead in the saloon. "There's no going back from it. Right or wrong, it's a brand, a brand that sticks." Yes, the picture works on that level, and on that level it was nominated as one of the best films of 1953. But if it only worked on that level, it would have grown dated, like "High Noon" and certain other classic Westerns. There are intriguing mysteries in "Shane," puzzles and challenges, not least in the title character and the way he is played by Alan Ladd. Ladd was a movie star of below-average stature and strikingly good looks, and for much of his career he worked around both of those attributes in roles where he was photographed to look tough and taller. 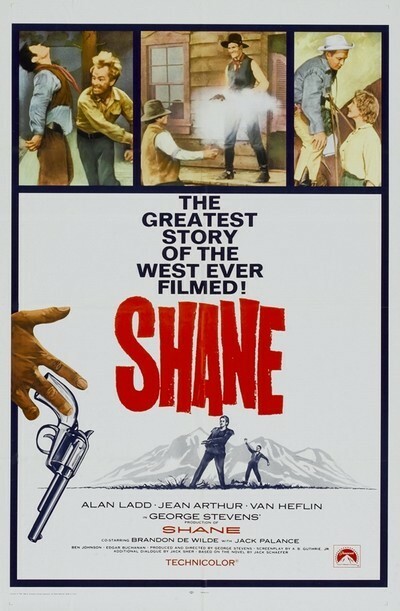 In "Shane," he is frankly seen as a neat, compact man, no physical match for the hired guns like Wilson (Jack Palance) and Calloway (Ben Johnson) who tower over him. He rides into town with a buckskin fringe on his jacket, looking a tad precious to my eyes, and goes to the store to buy a new kit--dress slacks and a blue shirt with an open collar that makes him look almost effeminate in contrast to the burly, whiskered gunmen who work for Ryker and live, apparently, in the saloon. His first visit to the saloon sets up the undercurrent for the whole story. Dressed like a slicker, he orders a soda pop. The cowboys snicker. Calloway ambles over, calling him a "sodbuster" who smells like a pig--a reference to his plowing duties on the farm of Starrett (Van Heflin). Shane asks, "You speaking to me?" Calloway replies, "I don't see nobody else standing there." The confrontation ends with Calloway throwing a drink on Shane's new shirt, while we're wondering if Travis Bickle was a fan of this film. On the farm, Jean Arthur plays Marion, Joe's wife and Joey's mother, and there's obvious chemistry between her and the handsome visitor who is now sleeping in the barn. She never acts on it, nor does Shane. They have too much respect for Joe, we sense. Little Joey is meanwhile so starry-eyed in admiration that Shane becomes a father figure, significantly teaching him how to fire a gun; during a fight scene, Joey watches happily while eating a candy cane. On the Fourth of July, Shane and Marion dance while Joe watches, his face showing not so much concern as recognition of the situation. Wilson embodies the older Western principle of might over right. There is a chilling sequence in which Torrey rides into town for a showdown with Wilson, and is shot dead. Stevens orchestrates it with hard-edged reserve, staying almost entirely in long shot, showing Torrey picking his way gingerly across the muddy wagon ruts in the road and then walking in the mud parallel to the saloon's wooden porch--a high ground where Wilson's strides match him. Torrey never even gets up onto the porch; he dies, outdrawn, in the mud. It is one of the saddest shooting deaths in any Western, comparable to Keith Carradine's death in Robert Altman's "McCabe and Mrs. Miller." The whole movie builds to the inescapable fact that Shane must eventually face Wilson and the other gunmen. If Shane is still alive afterward, he will have to leave town. He can't stay, not simply because he has been "branded" by a killing, but because there is no acceptable resolution for his feelings for Marion. Now why isn't there? Well, he could let Joe go into town and get killed, which is what Joe wants to do. That would leave Marion and Joey in need of a man. But Shane knocks Joe out to prevent that. He likes Joe too much, perhaps. Or does he? Shane is so quiet, so inward, so narcissistic in his silent withdrawing from ordinary exchanges, that he always seems to be playing a role. A role in which he withholds his violent abilities as long as he can, and then places himself in a situation where he is condemned to use them, after which he will ride on, lonely, to the next town. He has . . . issues. A story depends on who is telling it. "Shane" is told from the point of view of the town and of the boy, who famously cries "Shane! Shane! Come back!" in the closing scene. If we were to follow Shane from town to town, I suspect we would find ritual reenactments of the pattern he's trapped in. Notice that after stopping for a drink of water at Joe's place, he's all set to leave when Ryker's men ride up. That's when he interests himself in another man's quarrel, introduces himself as "a friend," displays his six-gun and essentially chooses to get involved in a scenario that's none of his business and will lead to an ending we suspect he's seen many times before. Why does he do this? There is a little of the samurai in him, and the medieval knight. He has a code. And yet--there'ssomething elsesuggested by his behavior, his personality, his whole tone. Here is a man tough enough to handle any threat and handsome enough to win the heart of almost any woman. Why does he present himself as a weakling? Why is he without a woman? There must be a deep current of fear, enlivened by masochism. Is he afraid of women? Maybe. Does he deliberately lead men to think they can manhandle him, and then kill them? Manifestly. Does he do this out of bravery and courage, and because he believes in doing the right thing? That is the conventional answer. Does he also do it because it expresses some deep need or yearning? A real possibility. "Shane" never says, and maybe never knows. Shane wears a white hat and Palance wears a black hat, but the buried psychology of this movie is a mottled, uneasy, fascinating gray. The emotional reality of "Logan"